Petaling Street, KL’s Chinatown, is a bustling heritage and shopping spot. The streets are lined with a myriad of shopping as well as a number of heritage buildings, clan houses and temples. The area has dozens of restaurants and food stalls, serving local favourites such as Hokkien mee, ikan bakar (barbecued fish), asam laksa and curry noodles. 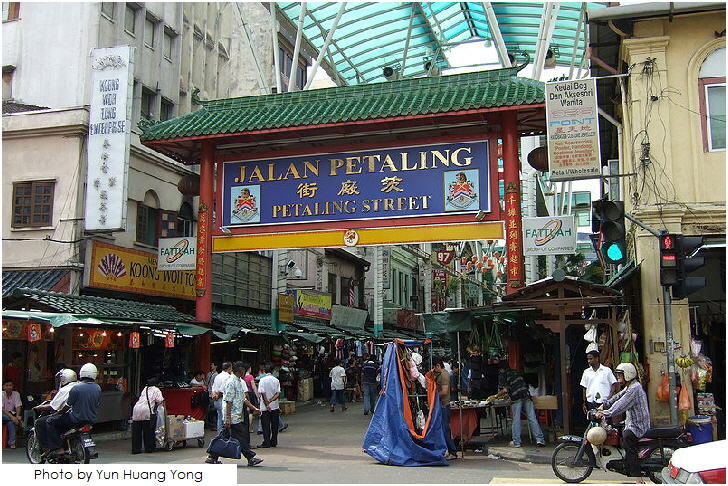 In 2003, Petaling Street underwent a major RM11 millions face lift when two large Chinese arches to welcome visitors were placed at either end of the street. A green roof cover was constructed, covering the whole street, dubbed the “Green Dragon”. The street is now totally pedestrianised and transformed into a pedestrian shopping mall. It is regarded as a heritage site. Petaling Street is still the best place to shop for counterfeit branded products and for trying out its large selection of local Chinese cuisine. For buyers, it is often possible to haggle on the price of watches, clothing and all the counterfeit items. The Street is always crowded not only with tourists, but also with locals. – Shop for fantastic bargains as well as gifts and souvenirs. – Sample local delights at the many local restaurants and food stalls lining the streets. – Visit the surrounding heritage buildings. – Soothe your tired feet by getting a foot massage.